Plans to build a ski resort on a national park in Kazakhstan have been met with local resistance. The proposal to build a new resort in place of a national park in Kazakhstan has become a contentious issue, one that has gone without a resolution since 2011. Recently the Kok Zhailau problem has gained more attention, with Kazakh social media celebrities, media actors and scholars weighing in on the issue. The state, in an authoritarian manner, has tried to deal with this rare challenge from civil society by attempting to manufacture support for its actions. The initial proposal to build a resort on the territory of Kok Zhailau and other nearby mountain territories was made 30 years ago. However, with the collapse of the Soviet Union these plans were put on hold, resurfacing again in 2005. The new plan was more narrow, but just as ambitious, with a proposed budget of $1.5 billion. A large part of Kok Zhailau national park was to be sold for building private property, particularly a ski resort. This plan sparked significant resistance with many environmental activists voicing strong opinions against the building of the resort. 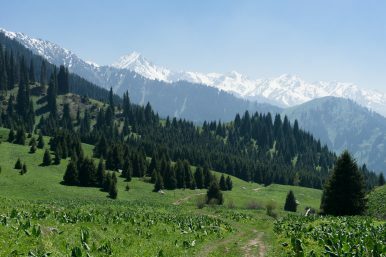 The main problems activists had with the plan were the risks it posed to the endangered species inhabiting Kok Zhailau, the potential damage that the ambitious plan to build artificial lakes could cause in Almaty, and the dubious need for the resort, given that Almaty already has two other mountain resorts. Azhar Dzhandosova, an activist, argued in 2011 that building of the resort would rob not only Almaty residents but all Kazakh citizens of an opportunity to enjoy the area’s unique nature. The revived proposal stalled back in 2015 due to the lack of funds caused by the financial crisis. In 2017, the Capital Partners organization made a new proposal to build in the park. This proposal contained a few modifications, with a significantly smaller budget of $20 million and the scale of the project greatly reduced. This scaledown was justified as making concessions to activists but could also be explained by the project now being fully financed by the state, with private investors leaving the project after 2015. The new proposal was put forth by the Capital Partners company, led by Serzhan Zhumashev. Zhumashev is a part of Almaty’s city council and is reported by Forbes to be one of Kazakahstan’s 50 richest people. The 2011 wave of protest was led by the Green Salvation ecological society and the Save Kok Zhailau group. These groups continue their activism, but lately the battle for Kok Zhailau made it beyond simply environmental groups, with more than 32,000 signing a petition within a moneht against building a resort. Given Kazakhstan’s barriers for online activism (for example, the global Avaaz petition website has been blocked in Kazakhstan since 2014), this result was impressive. This increase in support of those against the resort project was caused in part by a social media uproar led by public personas like the businessman Alisher Yelikbayev and charity director Aruzhan Sain. The most vocal in her support of Kok Zhailau was Madina Mussina, a controversial Kazakh blogger, famous for her public statements regarding various contentious social issues. Mussina cited Almaty’s notorious ecological problems that would only be exacerbated by losing the park as her main reason for her support. She also harshly criticized the way public deliberations were conducted, calling them disgraceful and alleging that the audience largely consisted of paid supporters of the resort. Almaty officials conducted a public hearing on November 4. Although there was no option to vote for or against the building of the resort, there was supposed to be an opportunity to voice opinions regarding the project. This was, however, hampered by public supporters of the resort. The level of support for building the resort appear quite high, with the League of Volunteers organization’s public letter gaining 100,000 signatures from university students. However, according to numerous accounts of Almaty university students, this support was gathered at least partially through coercion. Some students reported that after refusing to sign the letter, the have had their grades threatened by their university’s administration. Kazakh journalist Vadim Boreiko also established that the League of Volunteers received $138,000 in public funding since the beginning of 2018. The League of Volunteers replied to these accusations by reposting an article accusing Kok Zhailau supporters of receiving grant funding from U.S. organizations, the allegation being that their opposition to the resort was sponsored. Later the article was deleted. The usage of coercion and co-option of public organizations to emulae public support in autocracies is a common practice. For example, Russia has used school teachers to gain additional votes in favor of the ruling party. But recently Kazakhstan began taking actions to mirror the activity of civil society with pro-governmental organizations, with the creation of the Ministry of Civil Society and Religion (later re-branded as the Ministry of Social Development), establishment of public councils, and state funding of non-governmental organization. This shows that even though the Kazakh state doesn’t leave much room for genuine civil society actors, it still sees the need to maintain the appearance of public support to avoid an accumulation of resistance. This goes along with efforts to deter civil society organizations from getting foreign funding via monitoring them and the state funding civil society via grants, both of which contribute to the shrinking of civil society space in Kazakhstan. The outlook in this case is mixed. Activists voicing their opposition starting in 2011 likely contributed to the shrinking of the project’s scale. But despite a lack of consensus on the resort project, preparatory works on Kok Zhailau territory have continued. Nazira Kozhanova is a Master’s student in Political Science at the University of British Columbia (UBC). She is from Kazakhstan. The Ablyazov Affair: ‘Fraud on an Epic Scale’Can Kazakhstan’s Privatization Plan Succeed?Kazakhstan’s Political TheatreThat Stubborn Euro-Asia DivideIs This the End of the Nazarbayev Era?